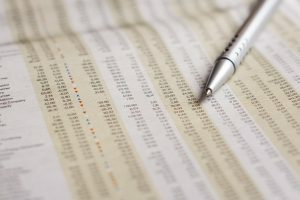 Home › Market News › Research & Analysis › Why the sell-off now? These fixtures are CHANGING as world GDP growth accelerates, and President Trump embarks, recklessly, on a plan to stimulate a strong US economy via tax cuts and infrastructure spending. It is no longer safe to assume, very low interest rates, low inflation and ample purchasers for US government debt. What sparked the sell-off were the January 2018 US payroll numbers. They detailed a 2.9% jump in hourly pay, the largest increase since June 2009. The US economy has added 10m jobs in since 2014 creating around 200k jobs per month. This data showed irrefutable evidence of inflationary pressures in payroll costs. Typically higher US wage push inflation translates into higher demand pull inflation. US consumer price data due 14th February (CPI +2.1% December 2017) will be important for gauging inflationary pressures. The US Federal budget deficit is expected to rise in fiscal 2018 to c. US$1trn. The financing of US deficits via the sale of US government bonds is an important factor for the yield curve movement, which has shifted upwards since 2017. A shift along the curve, as indicated, means investors require more return for holding T-bonds to compensate for higher inflation. Investors are concerned at expanding deficits given the US debt/ GDP ratio is now 104% (US$20.5trn December 29th 2017/ GDP $19.74trn (Q4 2017) and the likely impact being higher interest rates and a weaker US dollar. The above yield curve anticipates market expectations of at least three (0.25%) hikes in 2018. 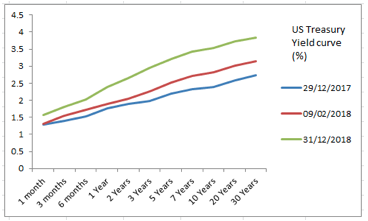 We can extrapolate a future yield curve at the end of 2018 if we assume the US Federal Reserve hikes four times (1% total) in 2018 and at least once in 2019. 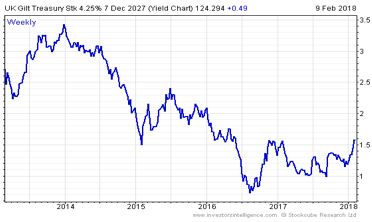 This provides a 10 year yield forecast of 3.53% end of 2018 from 2.83% at present. Higher inflation, rising bond yields/ falling bond prices creates headwinds for equity markets. Whilst their inverse relationship is not perfectly synchronised, it is closely related. Over February 2018, investors focused on the 10 year yield (YTM 2.83% +0.43%) have reasoned the 18% jump in yield translated into a 9.1% drop in Dow Jones (closing peak 26,616 January 26th 2018) (below). Should the yield curve continue upwards, we expect a 10 year yield of 3.53% (+24.7%) this could result in a 12.3% sell off for the Dow i.e. to 21,214. This would take US equities back to mid June 2017 levels. Overall it is fair to say US equities were expensive during January. A small correction was warranted and has taken place. Where the US market goes from here in the short term will depend largely on the direction of bond yields. This is a more fragile environment than one which constrains bond yields via QE bond purchases. Under former US Fed chairs, Ben Bernanke (2006-2014) and Janet Yellen (2014-2018) investors enjoyed a highly accommodative monetary policy for a period long beyond the end of the 2008-9 financial crisis. This period was unprecedented and exceptional, it was characterized by crisis-era low negative nominal interest rates, and a quantitative easing policy that purchased US government, agency and mortgage debt, the US Federal Reserve balance sheet expanded from $870bn in 2007 to nearly $4.4trn (source November 2017 Federal Reserve Quarterly Balance sheet developments). The role of the Fed, once summed up by a former chair is “to remove the punch bowl before the party really warms up” i.e. to take precautionary action to prevent inflationary excesses. The concern is the US Federal Reserve is “behind the curve” i.e. has not raised interest rates quickly enough because inflationary pressures are now apparent. The remedy is sharply higher interest rates. The US Federal Reserve under new chairman Jerome Powell is being tested. The board needs to get nominal interest rates to levels that provide a braking effect on inflationary pressures. It needs to reverse quantitative easing (i.e. quantitative tightening) via sales of US bonds. It needs to do these things without prompting a financial market crisis, or a reversal in the US economy. It is clear that 2018 will see US monetary policy normalize somewhat. This marks a departure from 2008-2017. Furthermore as the central bank bond sales continue, whilst the US budget deficit expands, this will exert an upward pressure on bond yields. It can no longer be assumed that the US will be able to find buyers for its debt at the same interest rate. 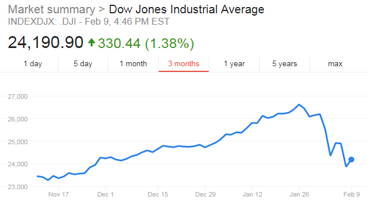 The year to end January 2018 saw significant gains in USA (Dow Jones +31%), Japan (Nikkei +18.1%), Hong Kong (Hang Seng +42%) and EU (Eurostoxx +12%). The UK market lagged global indices rising a pedestrian 6%. This suggests the UK should be more insulated against global price drops given it has not had the same magnitude of gains in the first place. The UK market has particular characteristics (low tech exposure/ high oil/ mining exposure/ sensitivity to Brexit issues and a weak UK government position post the 2017 election). UK blue chips have reacted by falling 8% – this reflects the broader global share sell off but also domestic developments. Firstly, UK gilt yields have “turned”. 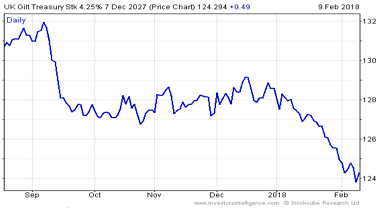 There has been a 6% sell off in UK gilts from 2017 peak taking the 10 year yield to maturity to 1.57%. The worry is UK yields are considerably below inflation > 3% and there is also inflationary pay pressures building. The Bank of England has made clear that Base rate might have to rise more quickly than the markets expect (currently two 0.25% hikes in 2018). A cursory glance at the 10 year gilt yield over the last five years suggests there is ample scope for yields to rise, possibly to at least 2%. Secondly the Conservative government’s commitment to the austerity plan employed by former PM David Cameron is slowly ending. Post its disastrous 2017 election result, the Conservatives are struggling to reconcile spending pressures from the NHS, Education, Defence (£20bn black hole in MoD) and welfare. The gilt market is starting to build in expectations for higher than forecast government spending. Finally “Brexit” is exerting political uncertainties that could result in leadership elections/ general elections. It is unlikely that PM Theresa May will last until 2022 without either a resignation or leadership challenge. Investors are right to be weary of a UK government led by Jeremy Corbyn. 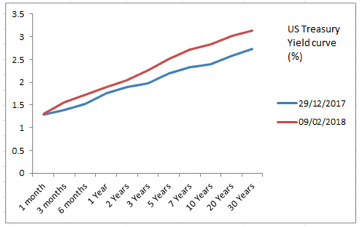 US and UK bond yields have yet to settle down, and will remain a focal point. Strong global GDP growth is creating inflationary pressures that will need to be carefully managed by central banks. A rising interest rate creates sector preferences i.e. benefits financial, banks/ hits utilities/ consumer goods/ retail companies. 2018 is likely to see twists and turns. The sell off so far has been sharp and swift, catching investors on the hop. It may well be that period ahead is interlaced with sharp movements either way, that will benefit “volatility” related investments. If you are seeking advice on the equity markets at this time or would like to discuss opportunities, then our advisory account may help. It is easy to get started and we place you under no obligation to trade with us. To find out more simply add your details below.